The marimbaphone’s bars were manufactured of high-quality steel, which provided excellent sustaining characteristics and projection. 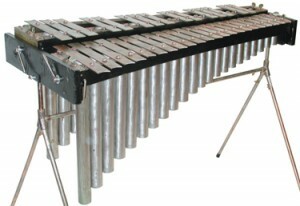 The instrument has several unique features, the most important one being the ability to independently rotate each set of bars to a vertical position, allowing the performer to bow the bars on the ends. 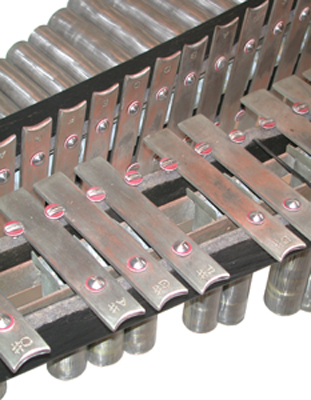 Additionally, each bar was manufactured with a curved end to assist with the bowing technique. 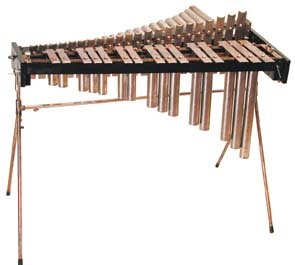 When the bars are in the horizontal position, the performer has the option of positioning the accidentals at the same level as the naturals, or in the more familiar raised and overlapping position seen on most malletA type of drumstick used to strike a percussion instrument. The shaft of the mallet is often ma... instruments today. The instrument can be struck with mallets as well as bowed when in the horizontal position, and can be performed on by more than one player using both techniques if so desired. Catalog G offered marimbaphones in ranges of approximately 2, 2 1/2, 3, 3 1/2, 4, and 4 1/2 octaves, with a variety of starting pitches. The instrument was also offered in “high” and “low” pitch tuning, as it was manufactured before the adoption of A=440 tuning by the American Federation of Musicians in May 1917. 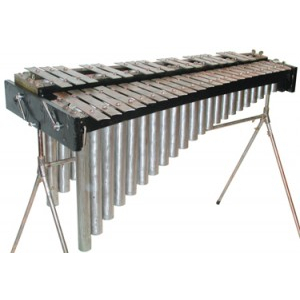 This model, 7015, is tuned in “high” pitch (A=440), with a range of 3 octaves (F2 to F5). The bars are from 1 3/16 inches to 1 5/8 inches in width, range in length from 6 to 12 inches, and are graduated in thickness from 0.6cm to 0.2cm from the shortest to the longest bar. It stands 32 inches in height, is 42 1/2 inches in length, and 20 3 /4 inches at the widest end.